When I was a kid, my dad and I were fishing buddies. We were experts (well, by our own standards) at catching rainbow trout in the lakes of British Columbia. However, once it came to the big fish in the sea…well, let’s just say that our hooks were sadly rejected by the coveted salmon in the area. For years, my grandparents owned a cottage about 45 minutes north of Vancouver, in the seaside enclave of Lions Bay. With a path that lead straight down to the rocks painted in seaweed, it was a location that just begged for an Old Man and the Sea moment. And so my dad bought a little boat that I affectionately refer to as a putt-putt. Water-skiing was not in the cards for our little vessel, but it was perfect for our early-morning fishing escapades. 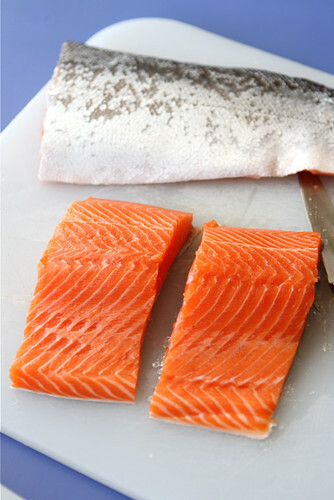 Luckily for us, there was never a shortage of fresh, wild salmon in the markets near the cottage or our home. My mum could prepare a whole sockeye at a moment’s notice, often barbecuing or baking it in foil, wrapped up with green onions, ginger and a touch of soy sauce. So, after a long day of fishing in the bay, we could still come home to a meal that starred the tender, flavorful fish and dream of the day when we could write our own Hemingway tale. Heat 2 teaspoons olive oil in a large nonstick skillet set over medium-high heat. Add red, orange and yellow bell pepper slices and cooking, stirring occasionally, until peppers starting to soften. Add water and 1/4 tsp salt. 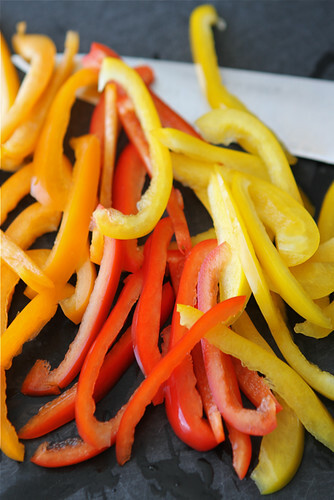 Cook until peppers are tender-crisp. Remove peppers to a plate, tent with foil and keep warm. Season salmon fillets with 1/4 tsp kosher salt and pepper. Add remaining 1 tablespoon olive to the skillet, set over medium-high heat. 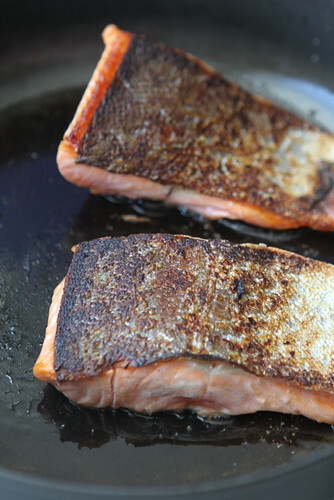 Lay salmon fillets, skin side down, in the skillet and cook until the skin is crispy, about 3 minutes. Turn over salmon fillets and cook for 2 minutes. 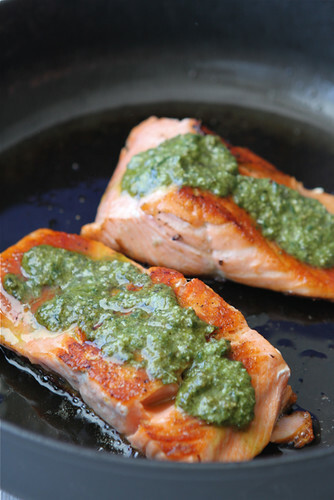 Turn salmon over so it is skin-side down again, spread 2 teaspoons pesto over the top of each fillet. Cover and cook until pesto is warm and salmon is just cooked through, about 1 minute. Divide peppers between 4 plates and top with salmon fillets. Serve. Add water and ¼ tsp salt. Cook until peppers are tender-crisp. Remove peppers to a plate, tent with foil and keep warm. Season salmon with ¼ tsp kosher salt and pepper. Turn salmon over so it is skin-side down again, spread 2 teaspoons pesto over the top of each fillet. Cover and cook until pesto is warm and salmon is just cooked through, about 1 minute. I just made salmon yesterday and try as I might did not get a great photo. You have conquered salmon photography if not fishing. Thanks so much, Val. The color of salmon throws me off, too. I got lucky this time! I love the salmon/pesto combo, this looks great! Thanks, Emilie. 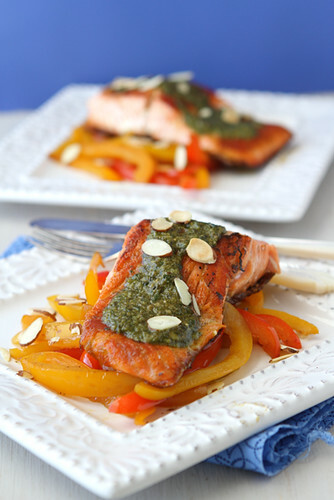 The flavors of salmon and pesto are made for each other! Wow- that salmon is just gorgeous Dara!!! Thank you, Winnie. It’s true when they say we eat with our eyes first. Dara, this is perfectly lovely! I adore Salmon with crispy skin on the bottom. Me too, Sommer. It is a secret treat I like to indulge in! Gorgeous, Dara! I love the way healthy food is so vibrant. Looks absolutely delicious! You’re absolutely right, Kristy. “Eating the rainbow”, as we’re always told to do, can be rather satisfying. I’m sorry we didn’t connect either, Alison. I hope we have a chance to see each other later this year. I love salmon and I’m sure this one is absolutely wonderful but most delightful was your story which took me back, no WAY back to my fishing expeditions with my dad. Salmon? No, not hardly. We lived in a suburb of St. Louis so rivers were it and in my case, it was nothing much more than a small, I mean REALLY small little tributary that flowed under a bridge. Where we caught crawdads. Today I might have to prepare them as langostinos but then they were just these little things I could catch and take home for…are you ready? A pet. Or at least try. My Dad finally got me to realize that taking them home meant their certain demise so we segued to catch and release. And for the rest of my life that’s all I’ve been able to do. I can eat fish caught by others but any caught by me have to go back. Not that I’ve ever caught one worth keeping! Thanks for the memories Dara…yours and mine. Oh, Barb – thanks so much for sharing this wonderful story. I can just imagine you carting home some crawdads in hopes it would become a beloved family pet. So sweet! We had salmon last night, and I didn’t think to put pesto on it!!! YUM! I’ll be trying this next time. As always Dara, THANK YOU for your wonderful ideas and recipes. BTW, I live in Vancouver, and I “oooh’d” a bit at your Grandparents living in Lion’s Bay. It is SOOO beautiful there. I’ll think of you next time I drive up the Sea to Sky. Have a great week. Thanks so much, Roz. Pesto is a wonderful pairing with salmon; we often spread a little pesto on our salmon burgers, too. Lions Bay really is a beautiful spot and I wish I could spend a summer there again. Great job today on Studio 5! Those fries looked delicious and so does this recipe! You looked fantastic on TV! Loved that shirt! Thanks so much, Traci! I had a ball doing that segment. Thank you for watching. My dad would love to have called me or my two other sisters his fishing buddies but it didn’t quite work out for him, LOL! We went fishing with him only once–he had a boat and often went alone–isn’t that sad?! However, we happily ate what he caught–mostly trout. 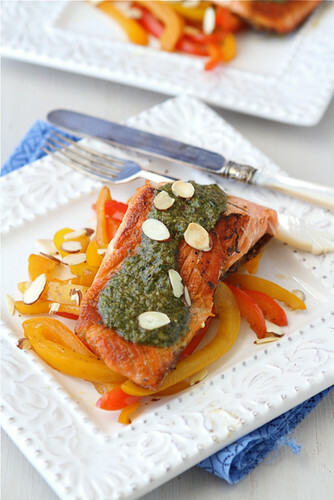 Love your seared salmon and I think pesto is a perfect accompaniment. I consider this a perfect meal, Dara. Thank you, Jean. I’m sure your dad was just as satisfied by the fact that you enjoyed his catch of the day. Brilliant! Pesto and salmon, who would have thought?? This looks fantastic! Thanks, Katie. Pesto and salmon are a wonderful combination. Once you try it, you’ll be hooked. I just love salmon and I will have to try it with pesto. A perfect dinner! Thank you, Milisa. It really did make for a wonderful meal. My dad was a big fisherman when I was growing up, but my brother was the one who always got to go out with him. I’m not sure I would have had the patience to sit waiting for the fish, though, anyway! 🙂 This salmon sounds wonderful, and makes me realize it has been quite awhile since I’ve even cooked fish at home. 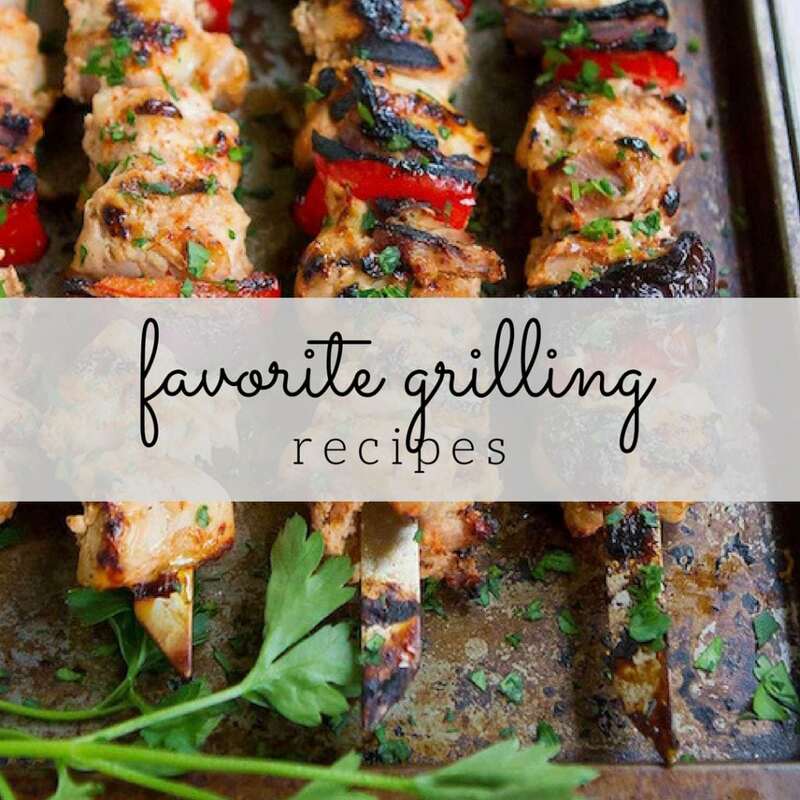 oh dara – I love seared fish and salmon is one of my favs. This looks outstanding. Seriously delicious! Love the fishing story with your Dad. Even if you never caught salmon, you caught something very precious – quality time with each other (I know that sounds terribly cliche, hah). You know, we love salmon but we just never cook it. I think I’m just afraid I’ll mess up, or maybe its the whole fish buying process that I’m relatively inexperienced at. Well…This recipe gives me a strong reason to get off my bottom and try. This article is a sign. I stumbled across your delicious/divine looking salmon recipe. I have been craving salmon for weeks now. It. is. time. Oh, that pesto on top looks so good. This looks so good! I grew up in the Pacific Northwest and love salmon! It is one of my favorite foods and reminds me of home. And I love the idea of pesto with it. 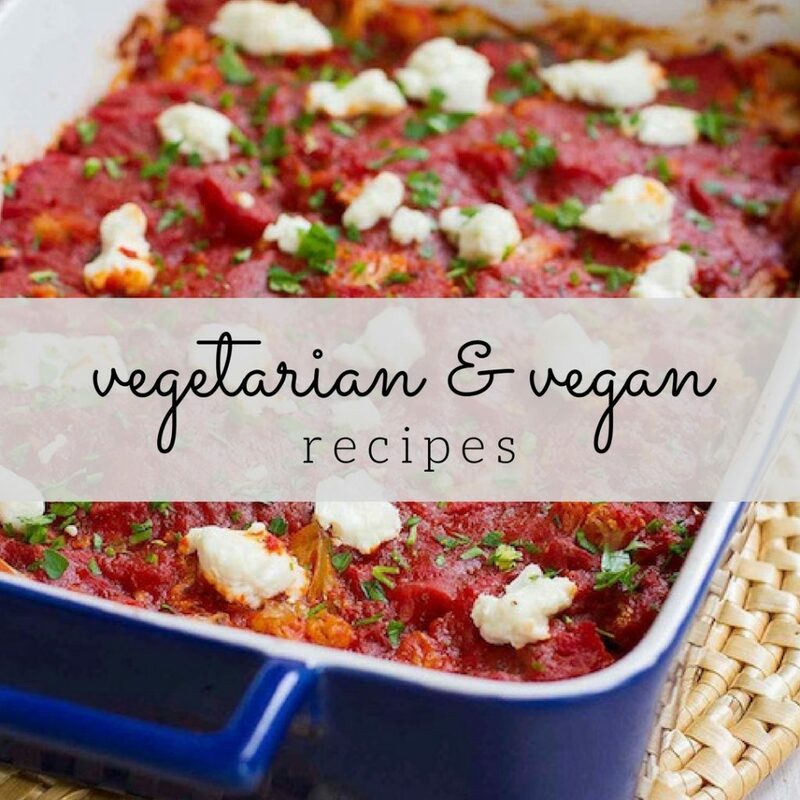 What a beautiful recipe, Dara! The colors, the flavors, everything works perfectly. Outstanding! I love salmon. And that sounds so good with pesto! Perfect my-kind-of-meal! Ohhhh I love pesto AND salmon… only natural they’d go together! Wonderful post Dara! Falvordul and very very delicious , love the almond notes in this dish! Great job! Salmon & pesto are a match made in heaven. Love the crispy skin too. Have you ever seen my Salmon with Basil Aioli ~ you would love it! I will have to check that out, Marla. It sounds fantastic! Sorry you never managed to catch any yourself, but your salmon looks gorgeous! Oh, my…why have I never thought to combine salmon and pesto? Super delish!!! Love, love, love pesto with Salmon! 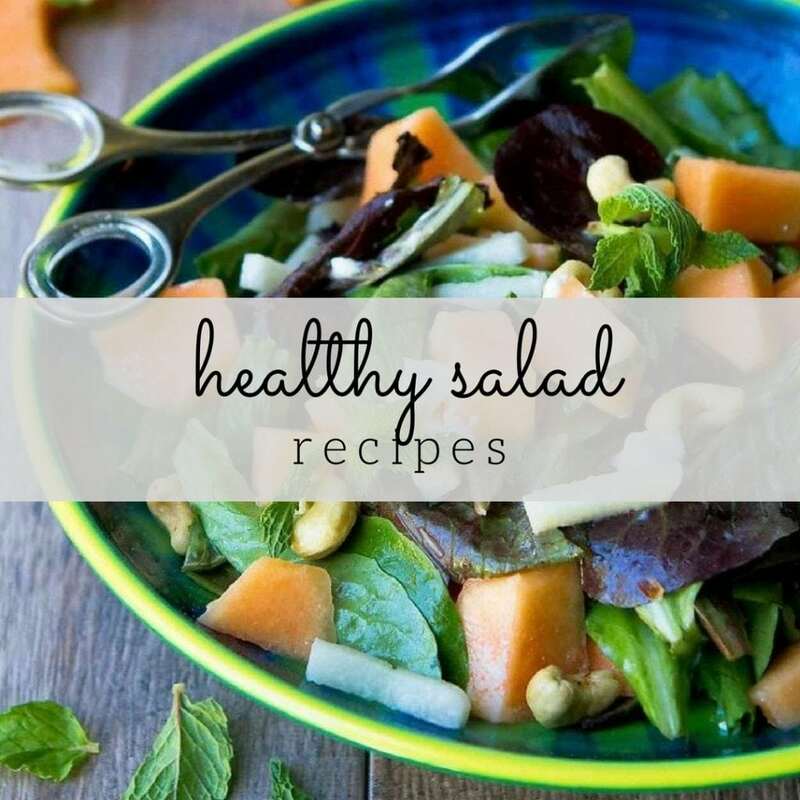 Beautiful recipe too!